MaryFran Simply...: Feature A Creature! Hello Everybody (-: Today I'm playing along with a new challenge I am so happy to have found! It's a monthly Penny Black Challenge and this month it is: Feature A Creature. I love all living creatures, so this was a must for me. 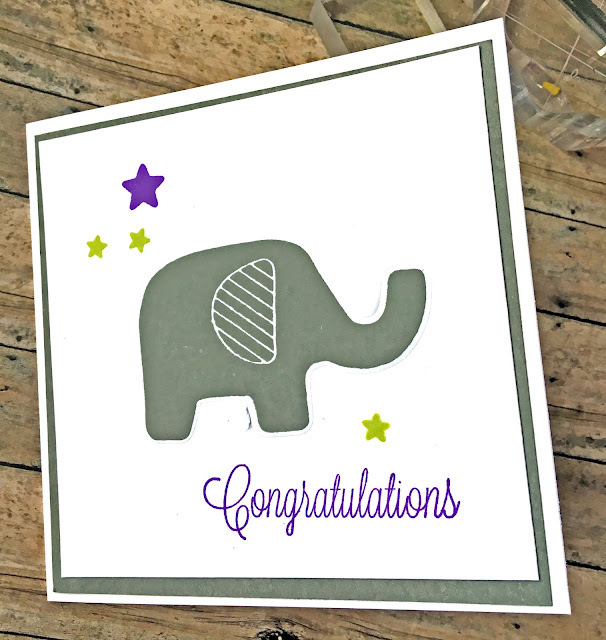 For this 4-3/4 x 4-3/4" square card I stamped the elephant in gray repeatedly with a MISTI so it would be nice and rich. Once dry, I did a dry emboss technique I saw Jennifer McGuire use. Here is the link to that technique: 7 Ways of Using Coordinating Dies Creatively. I really liked the detail this added so that I could keep this card clean and simple. I stamped the other elements and sentiment and it was essentially finished. I did not have matching card stock so I used some white card stock and rubbed the gray ink directly from the ink pad. I cut it slightly larger than the panel and adhered all to the card base. This card really used a minimal amount of supplies and I liked that a lot. Thank you for reading this and the materials used are listed below. Rainbows Help You Feel Better!